The drop down menu system is designed to give you access to all the functions of the software as well as various system settings. In addition icons directly under the menu system, allow quick access to the most commonly used functions and tools. The title bar displays the primary dealership of the currently logged in person, the currently logged in person, as well as log off and exit buttons. The navigation menu gives you immediate access to the key components of any dealership. These include a summary overview (home), vehicles, customers & suppliers, sales information, data export functions and reporting functions. Tabs in the navigation menu that have a triangle in the bottom right hand corner, allow quick access to the key functions within that tab without having to directly enter it. 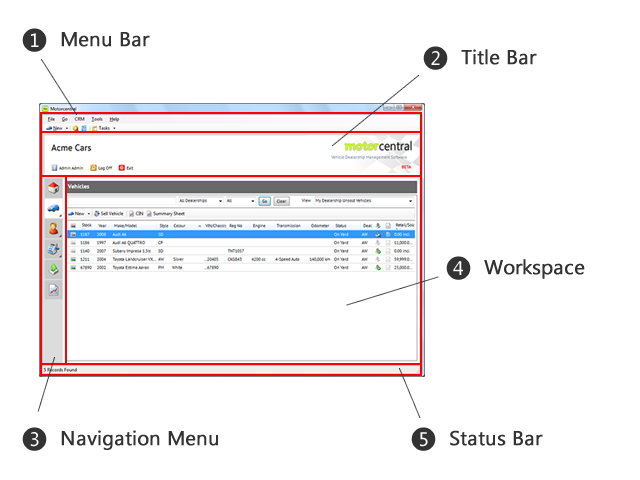 The workspace shows information specific to the navigation menu tab you are currently viewing. This may include a search & search results as well as various tools and functions related only to that tab. The status bar displays summary information relevant to the area of Motorcentral you are currently viewing.